Barbara Bobzien has been a member of the American Association of University Women for 67 years. In April 1923, the newly organized local chapter of the AAUW met for the first time in Janesville. The organization celebrates more than 95 years of civic work this month. Barbara Bobzien has been a member of the Janesville chapter of the American Association of University Women for 67 years. Barbara Bobzien was a young college graduate when she came to Janesville to work at the public library in 1950. Soon, a member of the American Association of University Women invited her to a membership tea, complete with silver service and dainty sandwiches. Bobzien was impressed with the nonpartisan group, whose mission is advancing equity for women and girls, and she joined the Janesville branch. Today, some 69 years later, Bobzien remains a steadfast supporter of the AAUW, well known for its used-book sale each fall. She looks forward to celebrating the history and future of the organization Tuesday, April 23, as the group wraps up its 95th year. The Janesville branch will honor past presidents and long-time members, including Bobzien. Current and past members are invited. Branch leaders see the event as a way to honor the past and raise awareness about the organization in the community. The group has not changed its mission since it began in April 1923, but the way it accomplishes the mission changes with the times. The 56 members of the Janesville branch conduct an annual book sale each November and an auction every other November. Money raised supports college scholarships for high school seniors and Project Renew recipients, who are women older than 25 going back to school. In the last 18 years, the AAUW Janesville has awarded almost $55,000 in local scholarships, Phillips said. In addition to fundraising, AAUW members look forward to monthly meetings September through May. The meetings include programs on current issues such as combating harassment in the workplace. Salinas and Phillips said the group is seeking new members. Members are graduates of either two-year or four-year accredited institutions of higher learning. The Janesville group is working with the Fort Atkinson branch of the AAUW and UW-Whitewater to organize a tech-savvy workshop for girls in grades 6 to 9 next year. “Girls will be able to choose from three breakout STEM activities, while parents will be able to learn how to encourage and help their girls,” Salinas said. The Janesville branch also has a monthly book club and organizes special-interest groups for members to build community and deepen friendships. Janesville women wasted no time organizing an AAUW branch in April 1923. Branch historian Mary Buelow said the national membership chairwoman from Washington, D.C., and the state AAUW president spoke at an informational meeting in Janesville on April 16. On Monday, April 23, local women elected officers, adopted a constitution and initiated the branch’s first project: scholarship aid to high school girls going to college. “These women had just gotten the vote,” Buelow said, referring to passage of the 19th Amendment three years earlier. President Joanna Sutherland led Janesville’s first AAUW branch, which consisted of 31 members and 11 associate members. At the time, Janesville’s population was almost 18,300. The General Motors plant had made its first Chevrolet car, and Henry Traxler became Janesville’s first city manager. 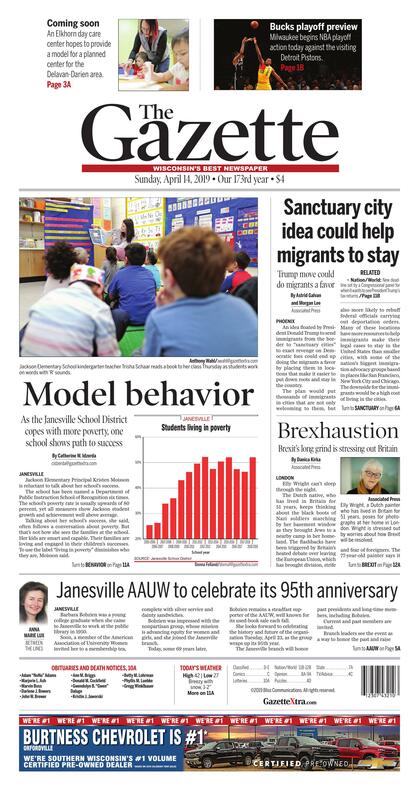 The 1920s were a time of huge change, and Janesville AAUW members focused on wiping out illiteracy at a time when education was not always valued, Buelow said. Members also learned about banking fundamentals, international relations, and the economic and legal status of women. The Janesville chapter did follow some societal norms. In the 1950s, its membership list recorded female members using their husband’s names, Bobzien said. Today, women are listed under their own names. Other things have not changed over the decades. Anna Marie Lux is a Sunday columnist for The Gazette. Call her with ideas or comments at 608-755-8264 or email amarielux@gazettextra.com. What: 95th anniversary celebration of Janesville branch of the American Association of University Women. Past and current members invited. When: 6:30 p.m. Tuesday, April 23. Where: Janesville Woman’s Club, 108 S. Jackson St., Janesville. Details: RSVP by Thursday, April 18, to csalinas3767@gmail.com. More information about AAUW: Contact Pat Phillips or Carole Salinas at AAUWJanesville@gmail.com, call 608-436-3050 or visit AAUW-Janesville.net. It’s also unclear how long the immigrants would stay in these cities because they are required to provide an address to federal authorities—typically of a family member—as a condition of their release. “New York City will always be the ultimate city of immigrants—the President’s empty threats won’t change that,” New York City Mayor Bill DeBlasio said in a statement. Elly Wright, a Dutch painter who has lived in Britain for 51 years, poses for photographs at her home in London. Wright is stressed out by worries about how Brexit will be resolved. Researchers at the London School of Economics’ Centre for Economic Performance, found that the “subjective well-being,” or happiness, of Britons has declined since the 2016 referendum—regardless of a person’s position on Brexit. The researchers believe this is because those in favor of remaining in the EU are upset with the outcome, and those who want to leave are unhappy with how politicians are handling the process. Karen Reed helps students with an art project Friday morning at The Learning Curve day care center in Elkhorn.